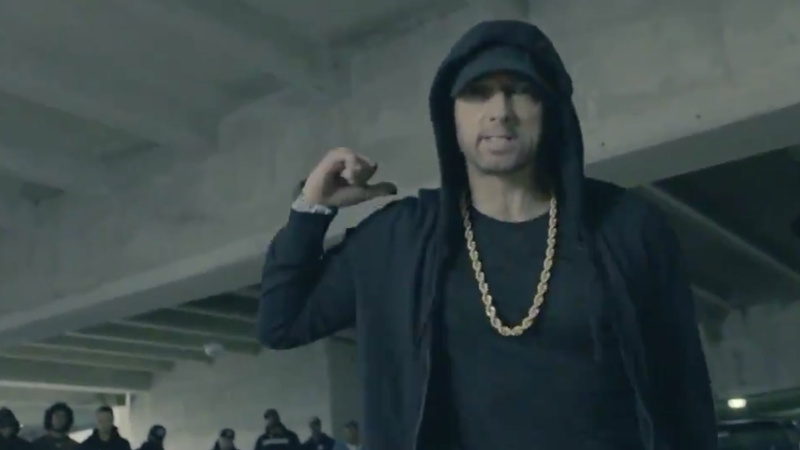 Eminem proved once again that he is a real MC with real bars when he gave voice to the frustration we are all feeling right now with racist-enabler Donald Trump in the White House. On Tuesday night’s presentation of the BET Hip-Hop Awards, a prerecorded video from Oct. 6 showing Em flowing for four-and-a-half minutes on the dangers of the Trump presidency made everyone stand at attention. Now, admittedly, it’s been a minute since we’ve seen some semblance of the Marshall Mathers who got five mics in The Source for his verse on “Forgot About Dre,” but that all changed with this rhyme that calls out the president as well as any Eminem fans who may support him. “This is his form of distraction. Plus, he gets an enormous reaction, when he attacks the NFL, so we focus on that, instead of talking Puerto Rico and gun reform for Nevada. All these horrible tragedies, and he’s bored and would rather cause a Twitter storm with the Packers,” Em seamlessly flowed a cappella. He called your president everything but a child of God, and it was magnificent. I know we have worn this particular saying into the ground, but I am going to use it here: Eminem has an invitation to the cookout. Don’t @ me, and before you start typing all fast in the comments: I said what I said.